Summer 2017 Science Expedition to Honduras — C.O.R.E. July 2017 saw the first engagement between international research organisation Operation Wallacea (Opwall), and CORE. Based in the UK, Opwall has been promoting the conservation of biodiversity for over 20 years, and currently has research programs around the globe, providing real world opportunity for high school students, undergraduates and postgraduates. While Opwall is not exclusively a marine research initiative, Dr. O’Shea was invited to their premier marine research site in Honduras to get involved in the various research projects being conducted there, as well as providing his expertise and knowledge on hand, for the 150+ students that were stationed there for between 1 and 8 weeks. Arriving in the early hours into San Pedro Sula – once regarded as the most dangerous city in the world – Owen was given 10 hours’ respite before the long journey to the coastal port city of La Ceiba where ferry would take him, and a bustling throng of excited students to the island of Utila for his first week’s residency. Utila sits in the Caribbean Sea, 18 miles from the mainland and is a mecca for divers, backpackers and researchers alike. Boasting beautiful beaches, accessible coastal coral reefs, a seasonal whale shark population, and a truly Caribbean style of lazy, laidback island living, Utila was a great place to start this adventure. During the seven days Owen was stationed there, he actively took part in several marine research projects including that of M.Sc. student, Tiara Stark from Ohio State University’s Department of Evolution, Ecology and Organismal Biology who was studying the population ecology and demographics of hermit crabs. Owen was able to take part in Tiara’s data collection processes and learned a great deal about these fascinating creatures. 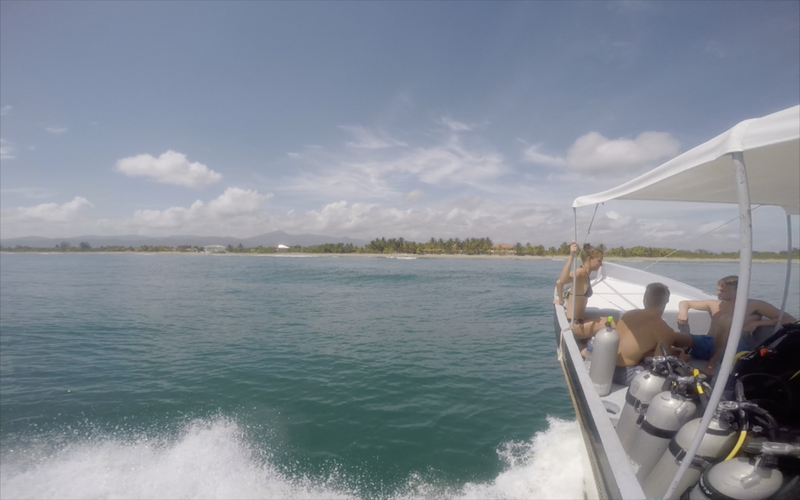 In addition, Oxford University undergraduate student Duncan O’Brien was in Honduras for eight weeks, using recent advances in modeling technology to assess linkages between habitat complexity on coral reefs, and associated fish abundance and diversity. Owen dived almost daily with Duncan and his team, led by Adam Southern from Newcastle University in the UK, and once more, Owen was give the opportunity to learn an array of new techniques and methodologies for coral reef studies. 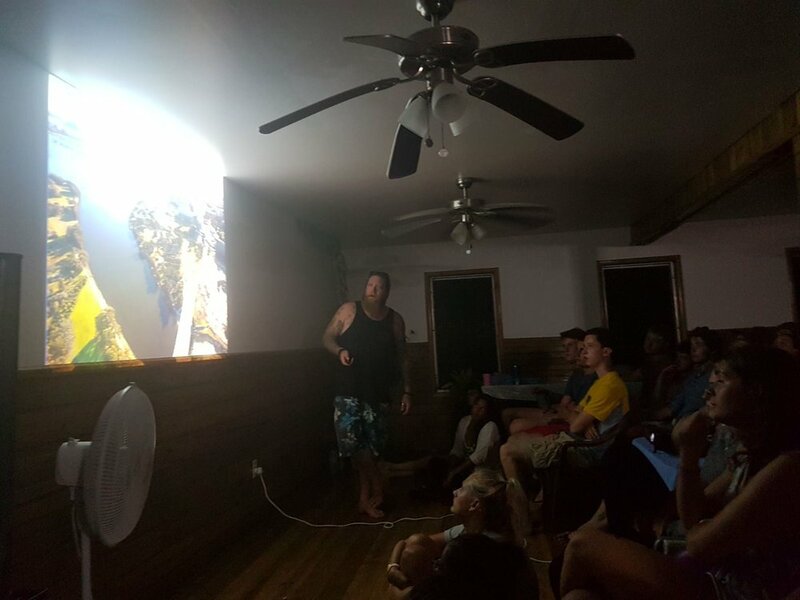 After the first week, having given several talks on his work with sharks and rays in The Bahamas and the establishment of CORE, Owen took a trip half way back to San Pedro Sula and stopped for another seven days in Tela, on the country's northern coast. In contrast to the clear, tranquil waters of the Bay Islands, Tela has dramatic rainforest covered mountains that lead down onto a relatively turbulent Caribbean Sea that lashes golden sand beaches that stretch beyond the horizon. Here, Owen was fortunate to work with Tela Marine Research Centre who are spearheading local research and citizen science initiatives into this fascinating coastal environment. The reef systems here are located several miles offshore, in deep, murky water and accessed by running small dive boats through the crashing waves for a typically bumpy 20-minute ride, but… something is happening here. Unlike Utila, with its clear waters, yet lack of hard coral structure, Tela has roughly 70% hard coral cover per m2 and abundances of the sea urchin Diadema antillarum, two orders of magnitude above average for this region. This particular urchin – like all herbivorous grazers in tropical marine environments – is essential for the health of these coral reefs, because they graze on the algae that is competitively superior to corals, and keeps the reef alive and healthy. This is so important, because in the early 1980’s, this particular species suffered an as yet unknown mass mortality across the whole Caribbean, resulting in a devastating loss of coral reefs across an entire bioregion. Here, Owen was able to see first hand the important work being conducted, and is attempting to assess why the populations of this spiny critter are almost uniquely abundant in these reef systems. A truly remarkable experience and one that Owen describes as a ‘highpoint experience in my career’. During the two weeks Owen spent as guest of Operation Wallacea and Tela Marine Research Centre, he was able to take part in new and exciting studies, share his work and the mission of CORE to over 150 students, educators and local scientists. This enabled the further understanding, first hand of the critical importance of involving communities in the data collection process, in order to provide capacity building and promote ownership of these fragile, and vulnerable resources. It was an overwhelming trip, and Owen is planning on returning in 2018 to assist in further research at the Tela site, and to work in synergy with these organisations moving forward into the future, as CORE establishes Caribbean wide network partners for collaborative research efforts. None of this would have been possible, without the generous support and hospitality of Dr. Dan Exton and Antal Borcsok, without whom, this expedition would not have been possible.